&Stitches: Share your Embroidery Floss Organisational Tips with us! Share your Embroidery Floss Organisational Tips with us! Photo of Julie's highly organised floss stash! I don't know about you but at the start of a new year I feel like de-cluttering and re-organising everything, including my embroidery floss stash! It's a bit of a mess right now but I'm definitely going to sort it out in the next few weeks. I keep my DMC skeins, sorted by colour (well that's the idea anyway!) in zip lock bags in a cute cabinet with drawers (available at IKEA). My Sublime Stitching floss is kept in one of the drawers as well and I have a shoebox full of Anchor floss too. My older DMC floss, on cardboard bobbins, is stored in a couple of plastic floss boxes. A photo album! Not for the larger floss stashes obviously. 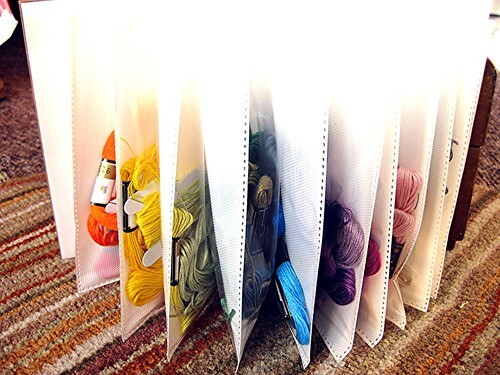 So what is your top Tip for organising your Embroidery floss? Do you sort by colour, number or type of floss. 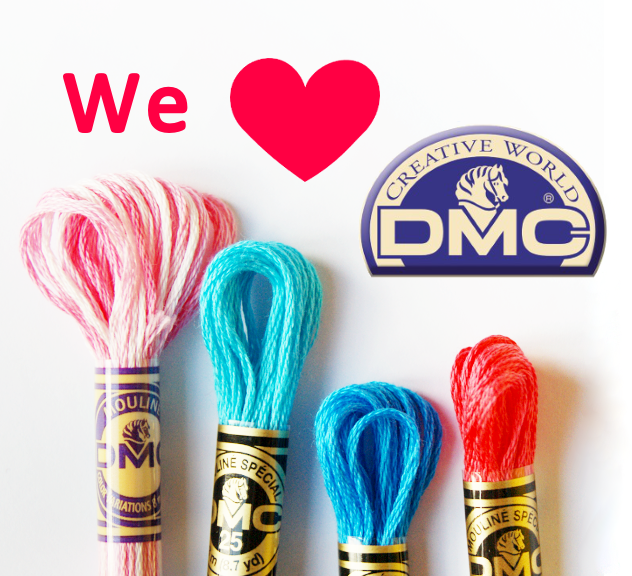 Do you keep your embroidery threads in shoe boxes, bags, bowls, fancy cabinets or on shower curtain rings? Perhaps you have an especially clever way of taking your floss with you on holiday? Please share it with us! for years I wrapped thread around those little plastic things - but what do you do with the useful piece on the needle when you are done? I started using the little Snack Bags - I put a label on the upper right corner with the number and punched a hole in the top. They are on rings that easily open and close (got those at Staples). At first I sorted by number, but now I have several lines of thread, so I sort by color - that way, if I'm doing my own thing, I have all of a color together to help make a choice. The rings hang on hooks on the side of a bookcase in my sewing room - just take the bags I need and put everything back. The great part is when a clothes pin is empty (numbers written on them) I toss it in a basket and I know what I need to buy. Hello! Nicole here (I wrote the blog post) This looks intriguing! Could you please share a close up of the pins/a pin and how the are attached to the frame? Thanks! Very cute!!! I throw mine in plastic ziploc containers by number. I have a 100 bin, 200 bin and so on. I leave them in original packaging because that would seem overwhelming and expensive. They fit in one drawer. I keep my Anchor stranded cottons in colour number order, in plastic bags of '50s' (which means more like 25-30!! ), then they go into the large central section of my main workbox. 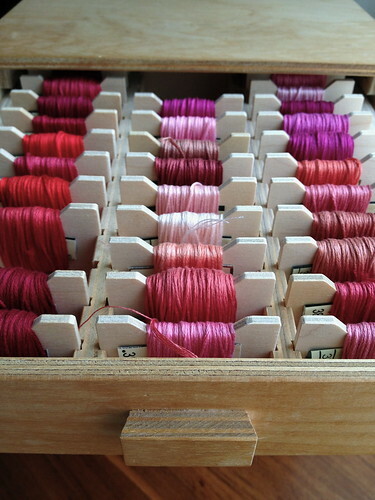 Other types of thread are arranged in colour groups elsewhere, including the jewellery supplies box that holds my Pipers silks. I have my DMC threads on cardboard bobbins in platic boxes, my inherited threads in an old cigar box, and my non-6-strand threads in a pink fluffy leopard print jewellery box. If I'm doing a project, I keep all the threads I'm using in a ziploc bag. I wind my thread on bobbins, write the DMC number in the corner, then store them by number in small plastic bags that are hooked into a metal ring. It's sort of a "thread rolodex." It's not perfect, but I got the rings and the bags from the supplies of a friend's friend's late sister, so I figured that I could put them to good use. I wind all my thread on cardboard bobbins and I have them in four plastic boxes and I'm about ready to expand into a fifth box. I used to keep them organized by color, but I'm trying out keeping them organized by number. I'm not sure how I like it yet, but it does make it easier to find a specific number color. I have another box full of my Kreinik threads on spools. I keep all my floss skiens in transparent boxes by colour. I currently have largish boxes for greens, blues, browns, reds, pinks/purples, and smaller ones for yellow, and then blacks and whites Mostly Anchor and some DMC. I have other small boxes with hand-dyed thread and variegated thread. Obviously there are crossovers with the colours but I know I need to bring down a few boxes when I'm looking for colours for a new project! When a skein no longer holds its shape well as I use it up, I wind it on cardboard bobbins with the number on and pop in my bobbin box. Saves lots of tedious winding all at the same time! So far this working well for me! I used a chart somewhere that listed DMC floss by color to set it up because I kept getting bogged down by what order to put them in. It doesn't have some of the newer colors, but once I had some basic order it was no problem working in other colors and non-DMC floss, which I don't have much of. Anything that's currently in use for a project is either in a bag with the project or else in a little plastic bin.